It's sad to know that a good show was done in. The Librarians has been cancelled. 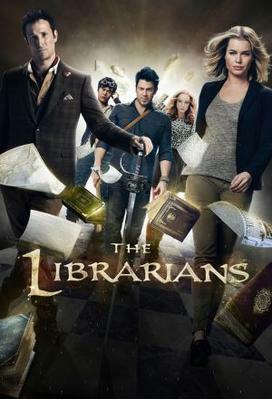 Based off The Librarian TV films, The Librarians was about three disparate people, along with their Guardian, to collect and protect magical artifacts. There was Cassandra Cillian (Lindy Booth), a mathematical mastermind, Jacob Stone (Christian Kane), an art and history expert who 'masqueraded' as a oil roughneck, and Ezekiel Jones (John Kim), a master thief. Their Guardian was Eve Baird (Rebecca Romijn), a former NATO colonel who knew her way around a fight. The current Librarian, Flynn Carsen (Noah Wyle) was ostensibly in charge but the Library, finding itself under major threat, removed itself from its original location. Fortunately, the Library has an Annex, under the watch of Jenkins (John Larroquette), the cantankerous and fussy Caretaker. Under the general supervision of Colonel Baird, these Librarians would be sent on various missions by The Clippings Book, where the clues would lead them to some magical artifact or entity which was either under threat or being misused, sometimes malevolently, sometimes not. Over its four seasons, the Librarians fought against a figure revealed to be Lancelot, Shakespeare's Propero and his henchman Professor Moriarty, the Egyptian deity Apep, and a rogue Guardian, Nicole Noone. What made The Librarians special in my view was that it was remarkably family-friendly fare. There was danger, action/adventure, endless romantic bantering between Eve and Flynn, and a big helping of humor. The Librarians was always a bit tongue-in-cheek, never taking itself seriously and more important, being remarkably clean. There was the off moment when something might be a bit visually intense or a foul word slipped through, but for the most part The Librarians was unapologetically frothy stuff. Each week we would get these characters into some supernatural situation where they would have to use their various skills to resolve the situation. The Librarians, both characters or plots, were never vicious or unfeeling. Instead, if you look at the series, The Librarians was a very positive show. It valued intelligence over brute force, using violence only when absolutely necessary in self-defense or defense of others. You had people who genuinely loved knowledge but who also felt that society would not accept them for that. Both Jacob and Cassandra in essence hid from the world, while Ezekiel misused his intelligence. As was so ably put by a henchwoman, 'one doomed by her gift (Cassandra with her brain tumor), one who fled his gift (Jacob, who uses pseudonyms when writing well-researched papers on art and architecture), one who abuses it (Ezekiel, who would rather steal than help others with his gifts). The Librarians created heroes and heroines who saw knowledge as tools for good and to defeat evil with, a rejection of violence and abuse. They lived out the maxim, 'Knowledge is Power'. It showed the importance of teamwork, where each character used his or her particular skill to help resolve the situation. They all brought something to the table, and united for a common purpose: to make the world a safer and better place, all without seeking credit. There were conflicts within the group, as one person would be either puzzled or frustrated by another, but I think that is remarkably realistic. It would have been more unbelievable if everyone agreed all the time. In other ways, I think you could find that The Librarians was a 'family' show. In essence, you had a family structure among the characters. Flynn and Eve were the parents: the scatterbrained-but-caring dad, the strong, protective mother. The Librarians reflected different personalities to their 'children': the tough but softhearted oldest brother, the perky upbeat kid sister, and the troublemaking but at heart loving baby brother. Jenkins was our somewhat cranky Grandpa who grows to love his charges. It was this sense of family, of the importance of each member that was one of The Librarians' strongest points. No character ever felt truly superfluous. Essentially, The Librarians was a sweet show that was full of whimsy, humor and adventure where people could identify with one or more of the characters and which found its strength in teamwork and knowledge. It had a frothy, fun sense to it, and was pretty self-aware. For my part, my favorite season was Season Two thanks to the figure I think was the best guest/recurring character: David S. Lee's Professor Moriarty. How I wish he had been able to return, for his Moriarty was simultaneously funny and menacing, charming and amusing. It will also mean that we won't get a return to the Gadget Gang, the motley group of cosplayers that was in essence a lighthearted spoofing of The Librarians fans. Like all elements of The Librarians, this was a gentle ribbing of the fanbase than anything mean-spirited. I can see why The Librarians was cancelled. TNT wants to be more adult-oriented, and something as overtly cheerful, inoffensive and family-friendly as The Librarians wasn't going to be in line with those plans. Noah Wyle has a new job as well, so trying to balance out producing The Librarians along with guest spots and occasional writing and directing for it would be extremely hard. There is also the issue of a slight decline in quality. The last two seasons two had some hiccups, particularly this season where there were some episodes that I flat-out did not like. Still, it feels such a shame given how well the show created its own mythos. I'll miss The Librarians, but I know that every time I see a beautiful building, I'll remember these wise words, "Architecture is just art we live in". The tagline was true: Heroes Like These Are Overdue.